Being aware of the splendor of the seasons, of the natural world, makes us understand man’s critical need for wild places. Living with familiar things and moving in the seasons can fulfill that profound need common to us all: a sense of place. It was time. Time for another trip to that place I find so special – Pocosin Lakes National Wildlife Refuge. It has been over two months since my last visit and I was getting antsy, so this past weekend’s nice weather prompted me to get in the car and go. Of course, I was hoping for bears or bobcats, but would take whatever nature would give me, as spring was starting to explode across the state. 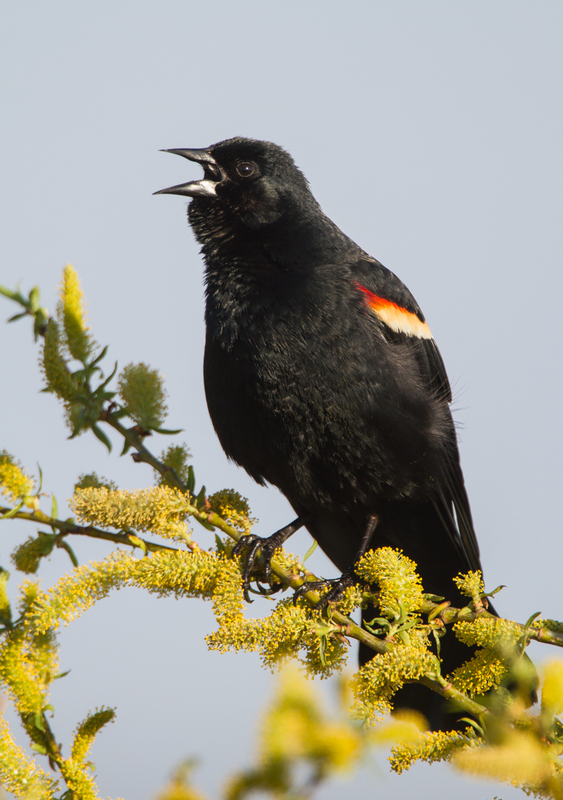 One of the first sounds I heard as I drove in was the distinctive, konk-la-ree call of the Red-winged Blackbird. Back in February, there had been tens of thousands of Red-winged Blackbirds foraging in the fields. Now, only a few males are singing from prominent perches, defending a territory, attracting a mate, luring a naturalist with a camera a bit closer. 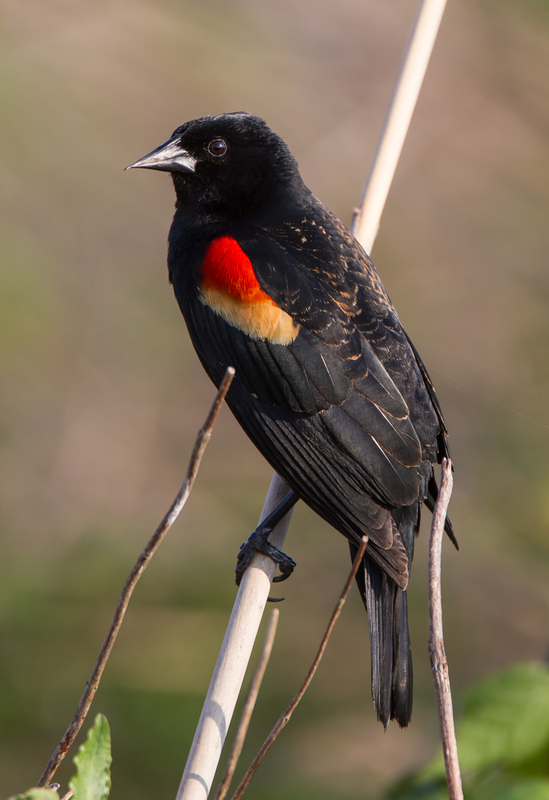 Males prominently display their red shoulder patches during the breeding season and respond to any nearby male that sings. I watched two going at it, calling back and forth, for several minutes. This one, perhaps a younger male (due to the brownish edges to its feathers) was always on a lower perch relative to the other, all black-feathered, male. These close-up views always make me appreciate the beauty of these birds and the sharpness of their bill. I was hoping to see some early spring arrivals and did manage a few such species in my day and a half – my first Blue-gray Gnatcatchers, Northern Parula Warblers and Purple Martins of the season. 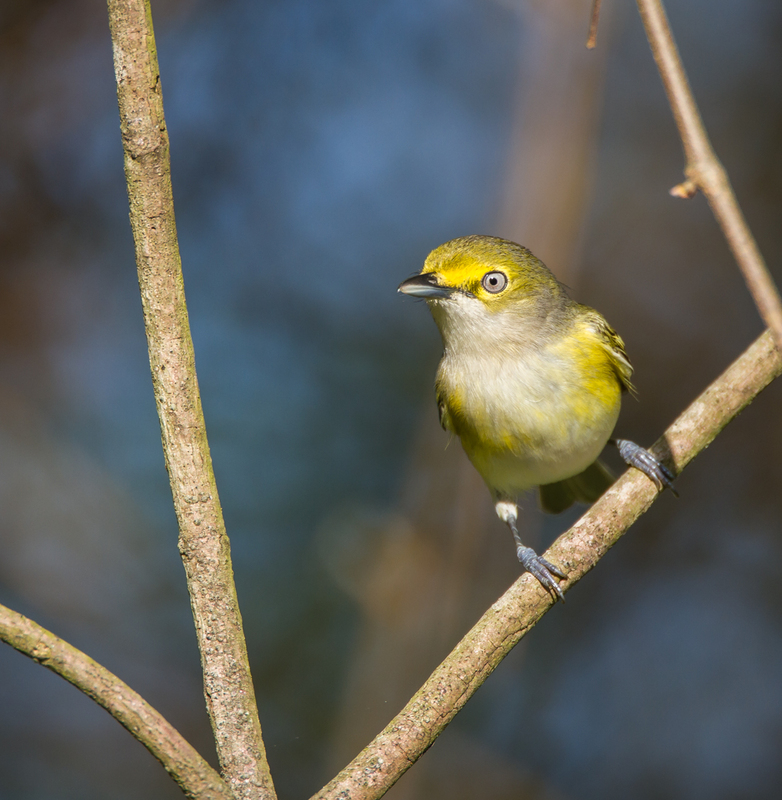 Then, while driving slowly down one of the refuge roads, I heard the unmistakable call of a White-eyed Vireo, and stopped to search. In a few seconds, the pale-eyed gaze of this beautiful thicket-loving bird greeted me. The call is described in most guides as CHICK-a-per-weeoo-CHICK, but I prefer QUICK, take me to the railroad, QUICK. The distinctive white iris’ are found in the adult birds – immatures have dark eyes. 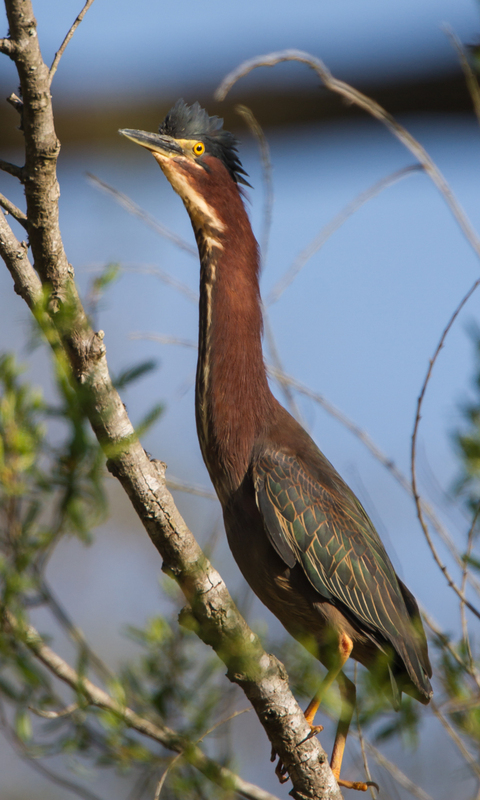 I also got quick glimpses of several Green Herons in roadside canals, but one bird went “out on a limb” for me as I drove past. I stopped and watched it raise its crest and stare at me with those intense heron eyes, before it flew off into the dense shrubs below. 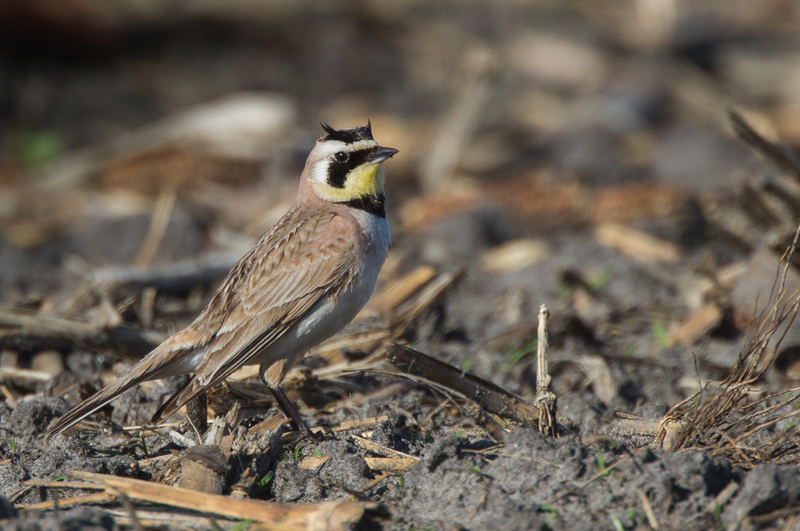 Another species that I have found here mainly in early spring is the Horned Lark. This is a bird of open habitats, and I usually spot them in barren fields before the crops have been planted. Their dorsal coloration looks like the bare dirt habitat they prefer, so I usually notice them while I am driving slowly and see what looks like a dirt clod moving. 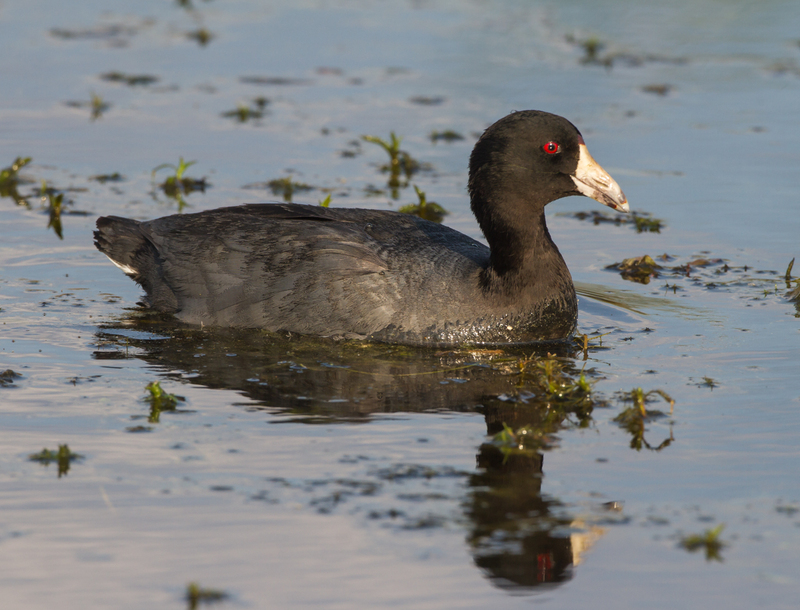 But a closer look reveals their subtle beauty and the unusual “horns” (tufts of feathers) of the adults. These birds do nest in NC (they are ground nesters), so perhaps this one already has a nest somewhere in the acres of open fields on and near the refuge. There were also some leftover “winter” birds, including several small flocks of American Coot, a lone Ruddy Duck, and a few scattered Blue-winged Teal. Although there are scattered records of all of these nesting in NC, I believe it is a fairly rare event, and I anticipate they will all be gone in a few weeks. I spent some time surveying one of the marshy areas looking for some American Bittern, as it was about this time last year that I heard them calling in an impoundment. Though one finally flushed out of the marsh while I was watching some Pied-billed Grebes, there was none of the unusual bittern calling to be heard. But there was the deep bass sounds of Bullfrogs coming from the marsh, especially on the first afternoon. The second day was much windier and this may have inhibited their calling. At first, I was trying to locate the callers along the edges of the marsh grasses. 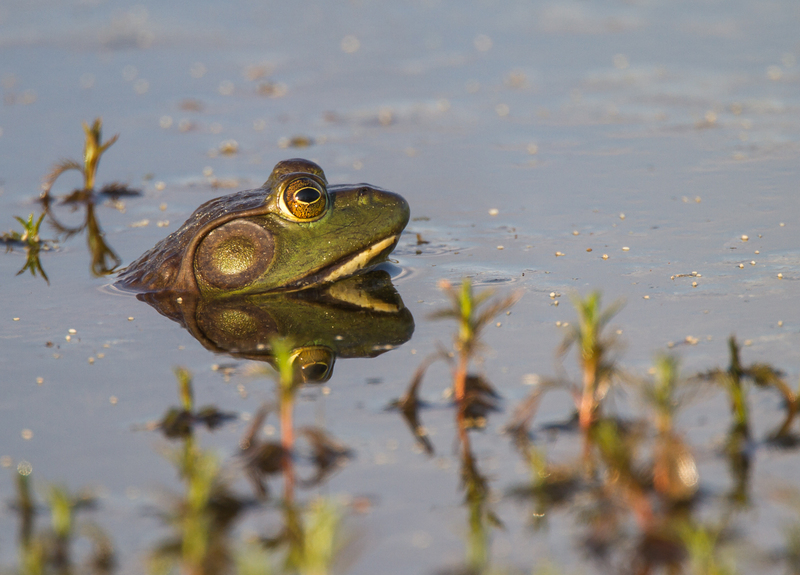 But, then I started spotting Bullfrog heads poking up out of the open water, mixed in with patches of emergent vegetation. The ones I saw were all males. 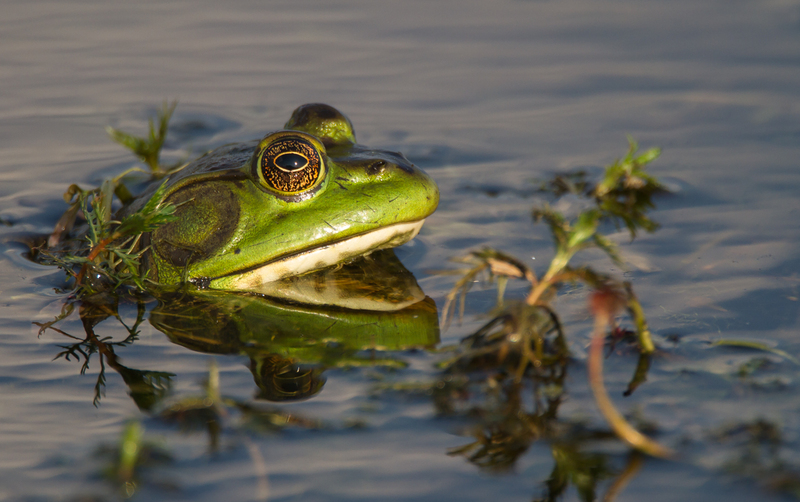 In male Bullfrogs, the tympanic membrane (external ear drum) is considerably larger then their eye (in females it is about the same size as the eye). The deep resonating calls have been likened to sounds made by cattle and have also been described by the phrase, jug-o-rum, jug-o-rum. Overall, the trip produced fewer wildlife sightings than I had hoped. While I did get plenty of views of Wild Turkeys, some Muskrats, Nutria, and even a couple of Gray Foxes, it wasn’t until late the second day that I spotted my first Black Bear, a youngster along the road edge on the south shore of Lake Phelps. 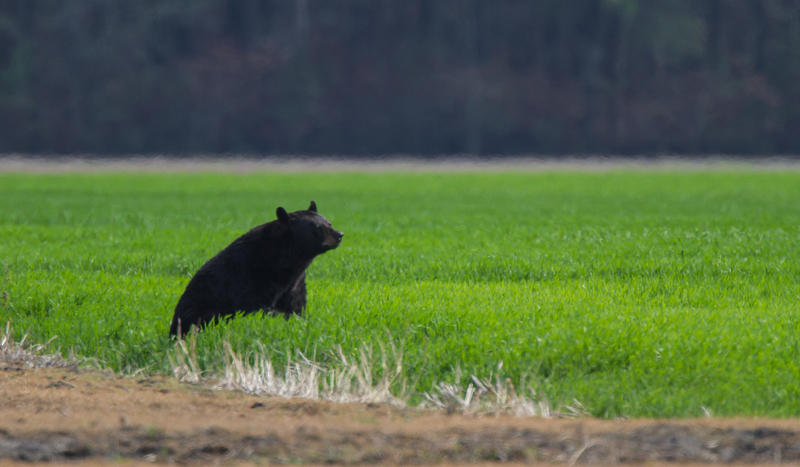 As I drove into the Pungo Unit for my final few hours of daylight, I finally saw a large adult Black Bear lying in a field of winter wheat. It was chowing down on the lush greenery and raised up to a sitting position when I stopped to look. After watching it for several minutes I drove on, leaving it to its dinner. I am a bit surprised I didn’t see more bears, but will look for them again later this week when I have a client group down that way. In spite of few bears on this trip, I look forward to whatever this special place cares to offer on my next visit. This entry was posted in Natural History, Trip report and tagged bullfrog, green heron, horned lark, pocosin lakes national wildlife refuge, red-winged blackbird, white-eyed vireo by roadsendnaturalist. Bookmark the permalink. Thanks, Petra. The early and late day lighting was pretty nice! Hi, always enjoy your blog! The last time I was at Pocosin, early March, the access roads from Phelps to the Pungo area were closed. Are they reopened now? thanks! Thanks. Unfortunately, no, Allen Road was still closed. Not sure what controls when they open it.